New York – Our Hometown, Inc. has launched its first client newspaper website in New Zealand. The Post of Franklin & North Waikato. The Post is a free weekly community paper, distributed every Tuesday. 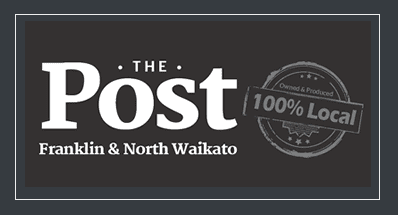 The Post is the only locally owned and operated community newspaper in the area, distributing 26,000 copies weekly in and around Franklin & North Waikato, reaching over 50,000 people weekly. This includes the Waiuku, Pukekohe, Karaka, Tuakau, Drury, Ramarama, Bombay, Awhitu, Waiau Pa, Glenbrook, Patumahoe, Puni, Pokeno, Mercer & Meremere areas of New Zealand. The Post has the largest circulation across the area. 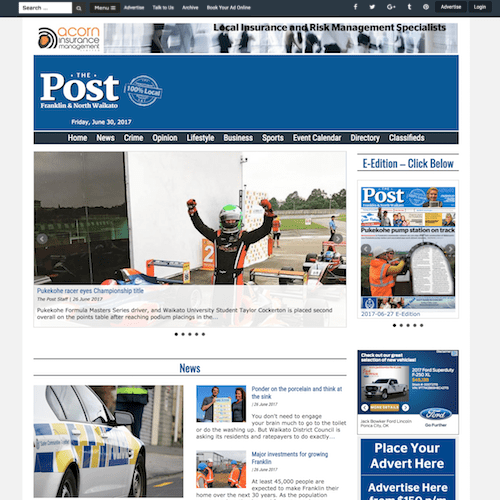 The Post is taking advantage of Our Hometown’s WordPress-based newspaper publishing platform – entering in all their content online and utilizing the reverse publishing feature, which allows newspapers to export their stories and images for layout in Adobe InDesign. Other features you can find on The Post website include extensive use of paid forms for advertising sales purposes, the digital e-edition, event calendar and an online classifieds system.